This is really making me hungry. 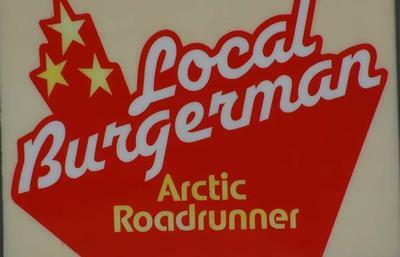 Just thinking about the "Arctic Road Runner's" Alaskan Banquet hamburger. Our favorite location is at 2477 Arctic Boulevard in midtown Anchorage. 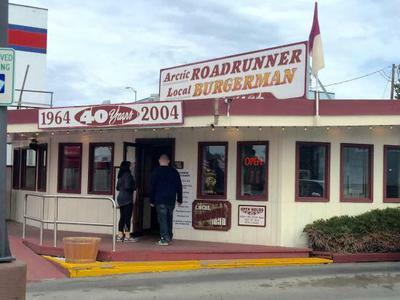 Back when the "Arctic Roadrunner" restaurant was just a trailer, my older brothers and sister and I drove up to the drive thru window and placed our order of several Alaskan Banquet hamburgers and sodas. On one visit, after we were handed the bag containing our order, we pulled over in the parking lot to eat. We sat in the car listening to, The "Royal Coachman," Ron Moore on the car radio. He was playing our favorite song, Elvis's, "Blue Suede Shoes." Then after our first bite of our hamburgers all you could here was "Yum! Delicious! This tastes so good!" We were having a blast as we listened to the radio while we were laughing and eating one of the best hamburgers and sodas ever. After that day the, "Arctic Roadrunner" became one of my sister and brothers favorite place to eat. Then, when Mike (who would become my husband) and I started dating in the winter of 1967 it became a favorite place of ours to eat. And later on it was a favorite place to go out and dine with our young children. Their hamburger menu has some interesting names. The "All American", "Alaskan Banquet", "Arctic Cheese", "Kodiak Island" and the "Kenai Whopper." Smaller burgers include the, "Lord Baronof" and also one of my other favorites, the "Attu Burger." Wow, I'm really, really hungry now! So, when in Anchorage, please go to, the Artic Roadrunner, our all time favorite burger restaurant that Anchorage locals and newcomers love and enjoy and have a lunch you'll never forget. I worked there back in 1975. I had such fun and loved that everything was made fresh. I remember making onion rings and milkshakes every day. Oh, I'm so hungry for an Alaskan Banquet hamburger right now. The Arctic Roadrunners are an Anchorage favorite. But it's also hard to beat a Lucky Wishbone cheeseburger basket. Our family even had a favorite booth in the Arctic Roadrunner location you mentioned in your story. Thank you for the yummy memories.